Figure 1 introduces a sequence of four chords which should be familiar as only the F sharp diminished seven is at all out of the ordinary. The idea is to play these chords as fingerstyle arpeggios, using your thumb on the bass note and playing the other three notes of the chord successively with the index, middle and ring fingers – and let them ring. Played one note per beat you will get a four bar phrase. 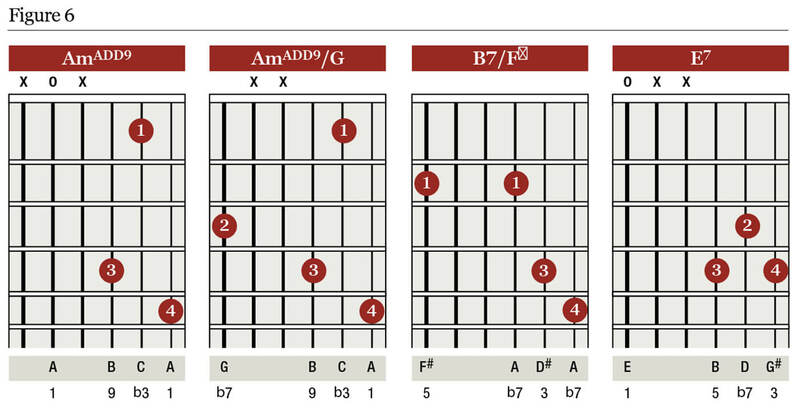 Theory-savvy readers will know that the F# diminished chord is functioning as a substitute for B7, and you can turn it into B7/F# by standing your index finger on its tip on the D string and playing the B string open. Try it both ways and see which you prefer. An added ninth chord adds colour to a major or minor chord, so in figure 2 we have A minor add nine followed by A minor add nine with G bass. In these two chords the minor third and the added ninth are only a semitone apart, which makes a pleasing clash and adds interest to the sequence. We have also experimented with a B diminished chord. Unlike the diminished chord we used in figure 1 this one has no seventh – it is just a triad. We have tried to create a sense of melody within the chord progression by moving the notes of each chord to the next by the smallest steps possible. This is known as ‘voice leading’. We are getting in early with this month’s theory moment: Am/G consists of the notes A, C, E and G. Rearranged, these could be C, E, G and A, which is a C6 chord, so these two chords are pretty much interchangeable. C major seven occupies similar harmonic territory to C6, the added B being same note as the added ninth over A minor. All this is a long-winded way of explaining why the second chord in figure 3 can be C major seven. Arpeggios can be more interesting if the notes do not predictably rise or fall, so we have rearranged the order of the notes in the first two chords, and gone for higher inversions of the last two, meaning that the highest note of the chord is now the third note to be played. 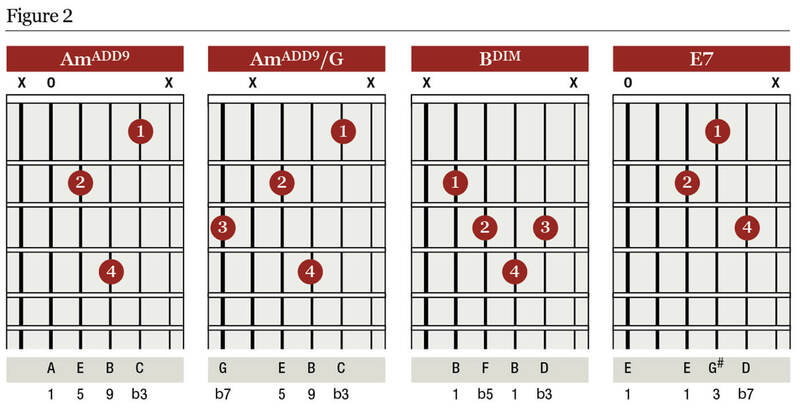 In figure 4 we add the note D to the first two chords. This creates Amadd11 and Cadd9, a different flavour of added note to those we tried earlier. Since we haven’t actually used a B7 chord in any of the examples so far, we’ve gone for a very colourful B7b9 with D# bass as the third chord. Holding the flat nine over into the E7 chord as a flat 13th shows that in this kind of sequence you can discover some cool sounds by hanging the notes of one chord over into the next. 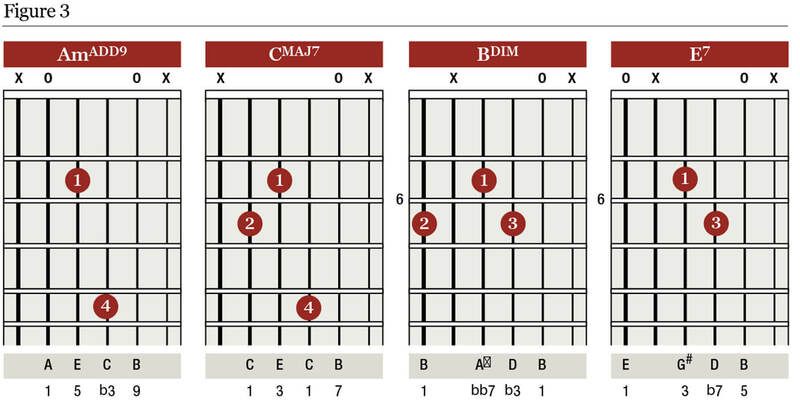 Anywhere there is a major chord it is worth giving a minor chord try, and that’s exactly what we do in figure 5, where the second chord is now Cm13. It is an intense sound, but the closeness of voicing from the previous chord helps it to fit in, and we only need to move it down one fret to arrive on Bm13, which leads very smoothly to the E7 chord at the end of the sequence. 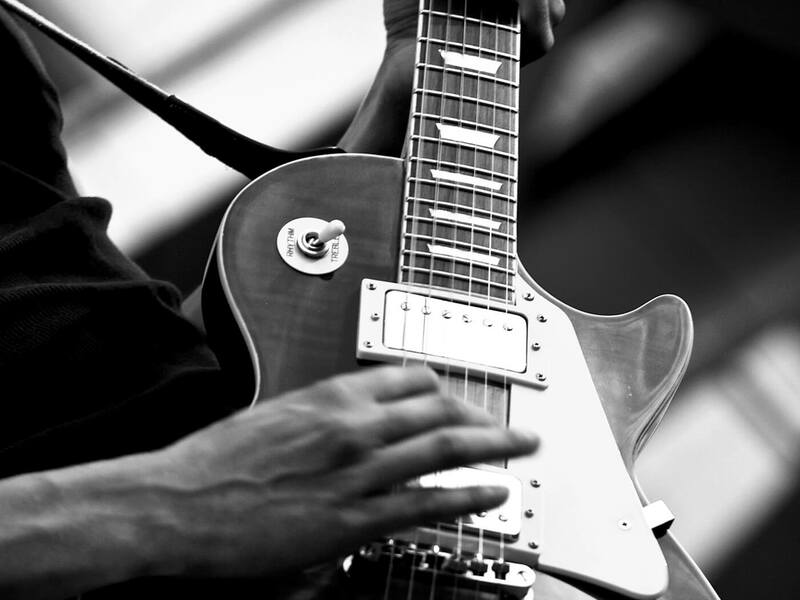 The fret hand is stretching out a bit here, but keep the fingers on their tips and continue to let the notes ring on. 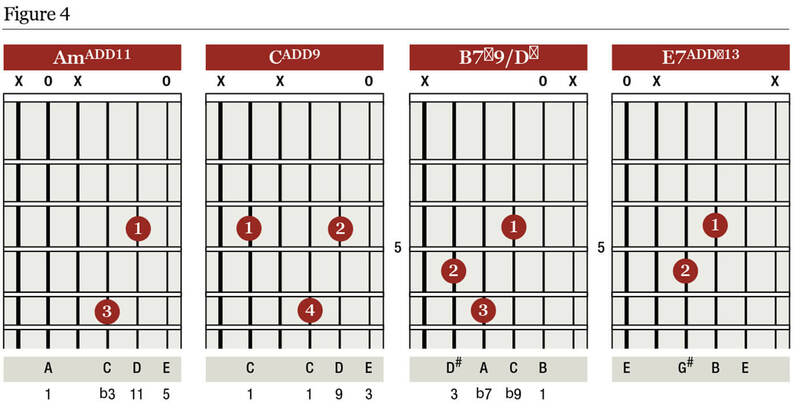 Spreading out the notes of a chord, such as the first chords in figures 5 and 6, has a slightly different effect to clustering the notes tightly together. 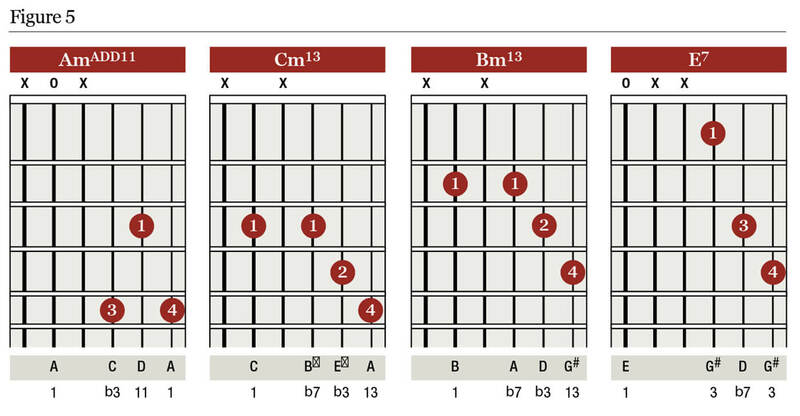 Compare those chords with the first two chords in figures 1 and 2. They are all of a broadly similar flavour, but the ‘opened out’ voicings have a little more angst due to the bigger leaps between the notes. 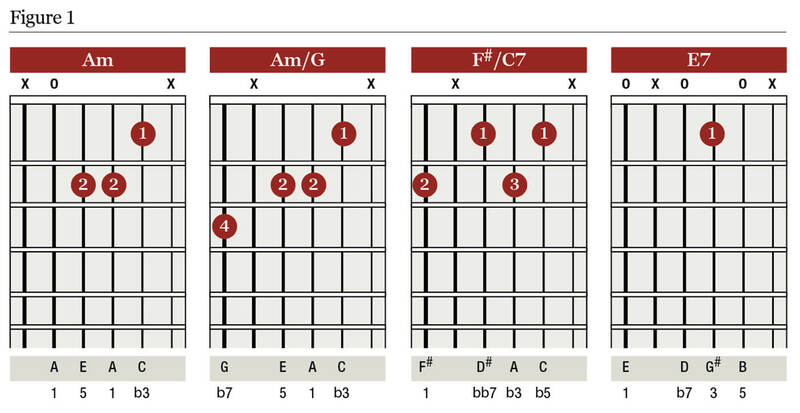 If the big stretches at the start of figure 6 are a problem try putting a capo on the guitar a few frets up – we enjoyed the sparkly tones with a capo at the fifth fret. You might notice that we have more or less returned to the original chord sequence from figure 1. Play your favourite four examples from figures 1 to 6 as a loop and you’ll get a 16-bar song section. How about recording it and seeing if you can add a guitar solo on top? Have fun and see you next month!